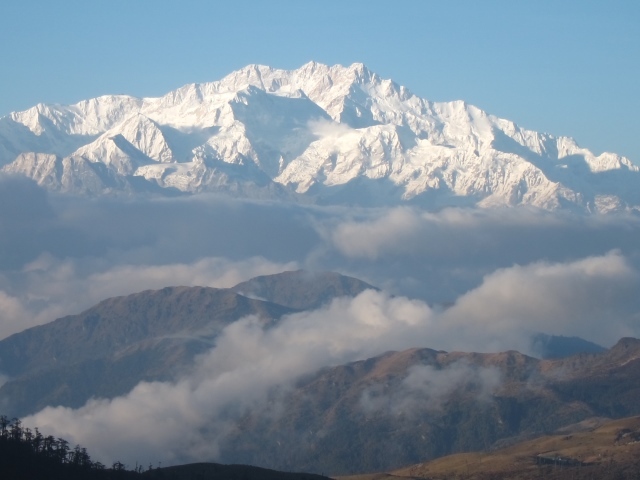 A relatively easy circuit up onto the lower (southern) Singalila Ridge, which commands outstanding views of the snow-clad peaks of the high Himalayas, including 4 of the world's 5 highest mountains, one of which is the local lad, the glorious snowy mass of Kanchenjunga. 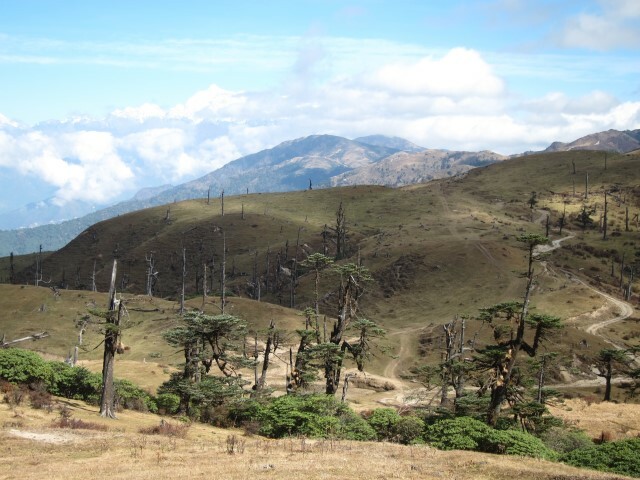 This is a high, remote(ish) walk in mountains, where the altitude will affect you: come prepared. 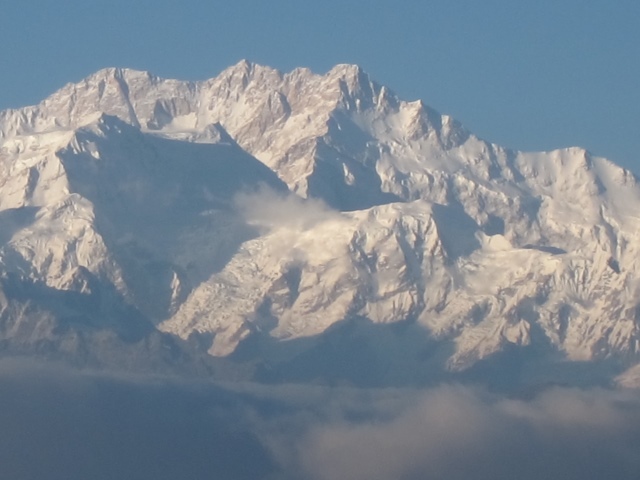 The Singalila Ridge rises steadily from the broiling lowlands of the Indian plains to the majestic, icy vastness of Kangchenjunga, at 8,586m the world’s third highest peak. 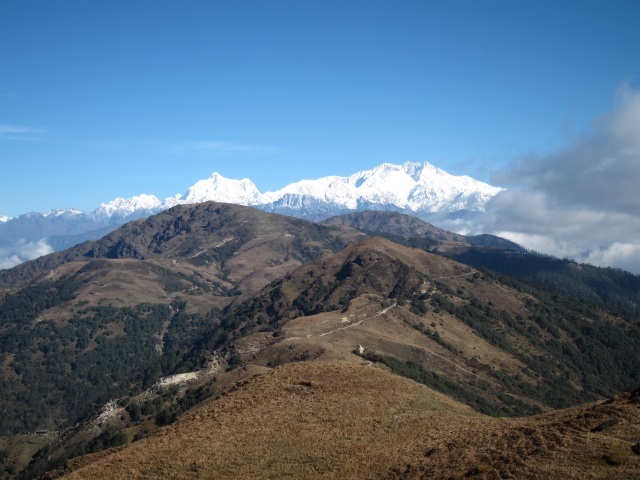 This is a delightful walk, ascending through wonderful forests to a long high central section of the Singalila Ridge, gaining superb (really unbeatable) views of the high Himalayas. 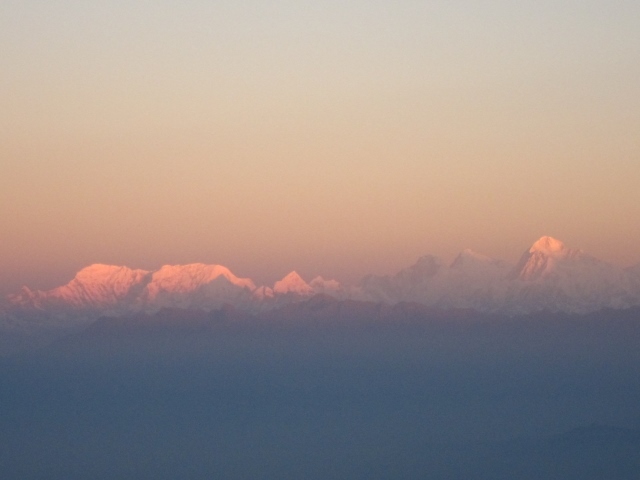 The early and late views are outstanding – you can see four of the world’s five highest peaks from the ridge (Everest, Kanchenjunga, Lhotse and Makalu) in vivid, slanted colours. 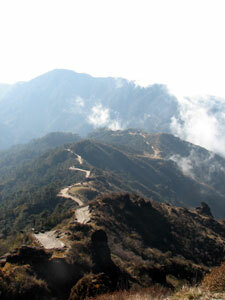 (Most of the ridges you walk are above 3,000m – high but not too high!) 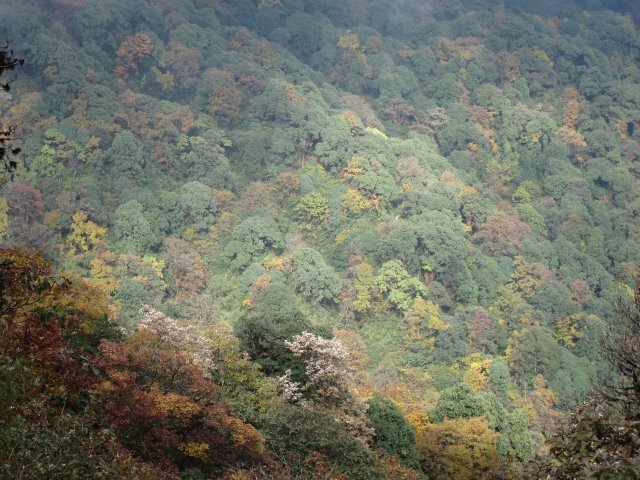 Wonderful flowers in spring but the best views are in Autumn. 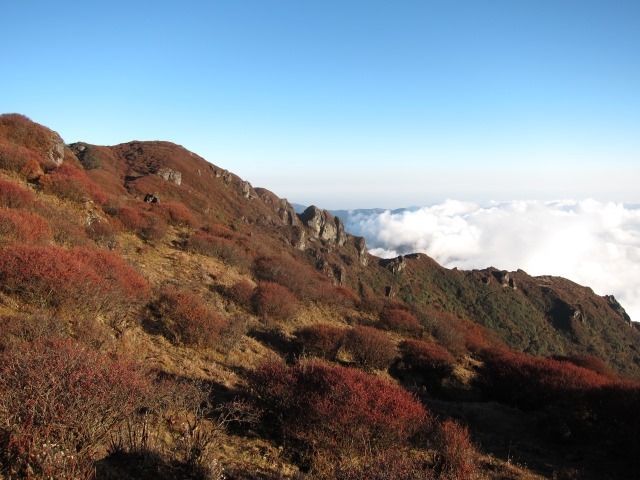 In essence, you spend 3 days getting onto the main ridge and acclimatizing – you will camp at over 3,600m on the high ridge. 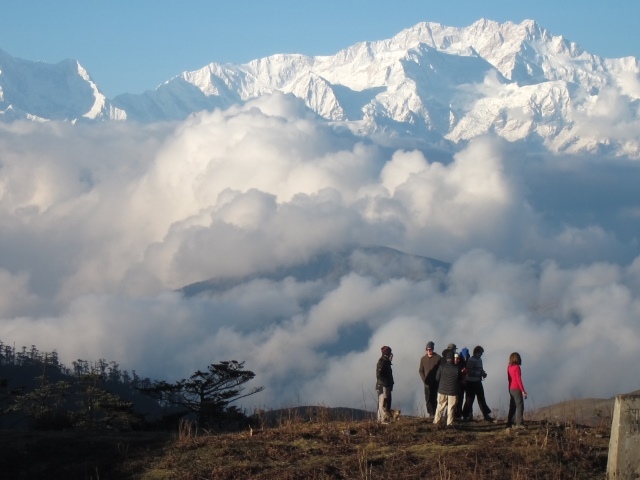 You then have 1 ½ days of meandering along the high ridge toward Kanchenjunga, some of the best walking to be had anywhere, followed by 1 ½ days of descent. This means that days 2 and 3 are quite short. 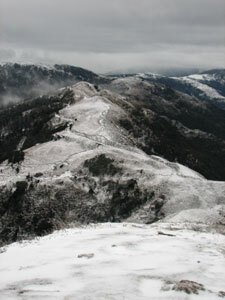 The ascent and descent are fine walks, with exciting views, in their own right, so don’t be put off. 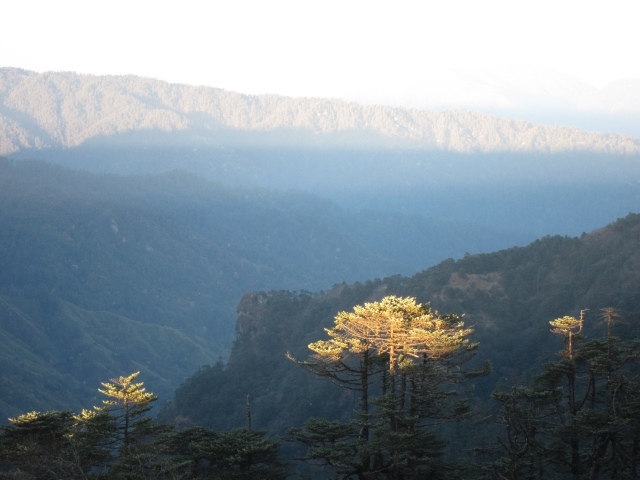 As well as extraordinary views, you will be delighted and fascinated by the vegetation zones you pass through – mixed forest, to bamboo, to rhododendron-and-pine, to shrublands, to grassy ridgetops. Some of it looks sculptural, some downright weird. (Don’t expect virgin forest, though.) Fauna include red pandas (which you are sadly most unlikely to see), bear, boar (which you might),Barking deer and psychadelic pheasants. 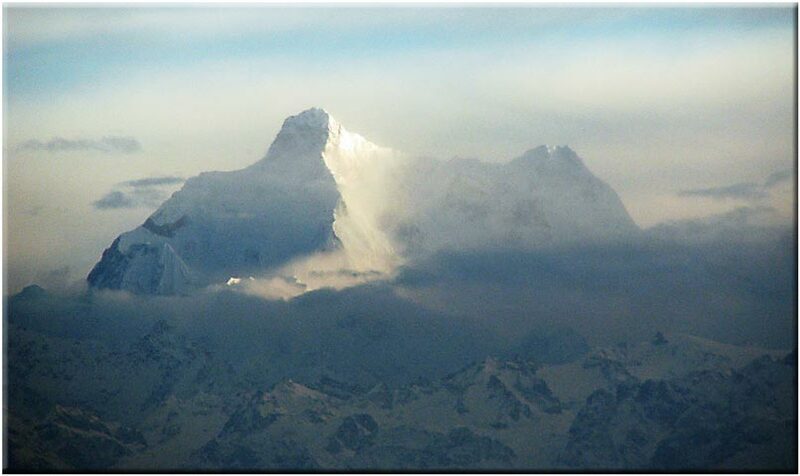 The Singalila Ridge forms the border between India and Nepal, and you will spend some time in Nepal. The area was sensitive at the time of the Maoist insurgency in Nepal, and you still have to sign in at various military checkpoints. 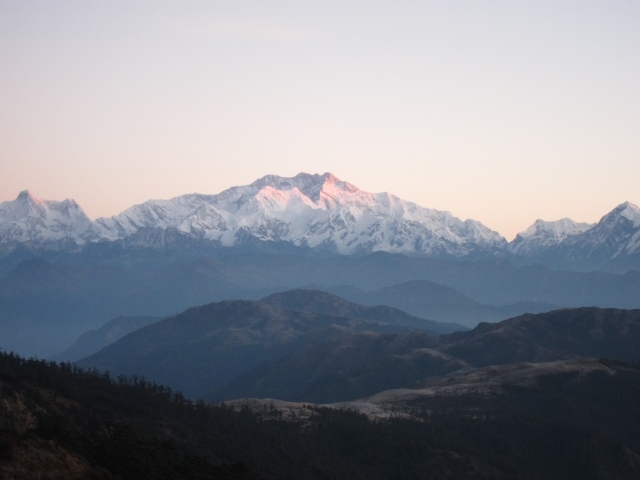 The Indian side is visibly different from the Nepali: as a National Park, it is cloaked in rich and wild, if not actually virgin, forest, with little habitation, whereas the hills are deforested and the valleys heavily farmed on the Nepal side. 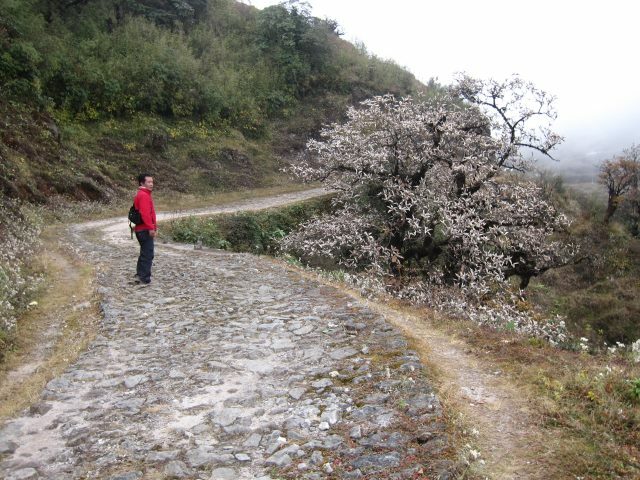 You will pass teahouses, hamlets and army checkpoints, but are usually above regularly inhabited land here, while passing through some high, summer grazing meadows. 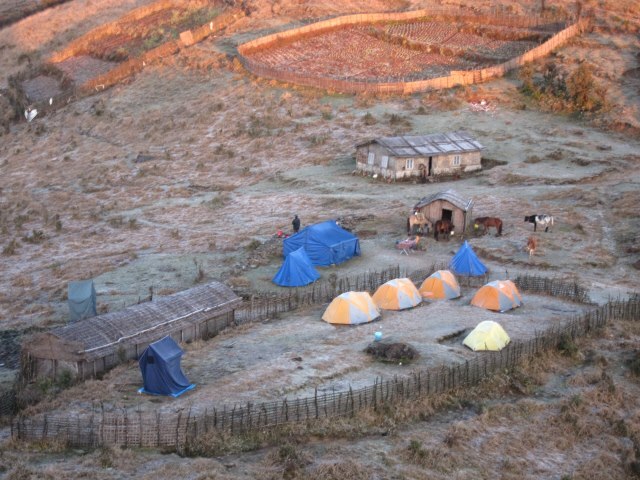 You can stay in simple mountain huts, or camp. 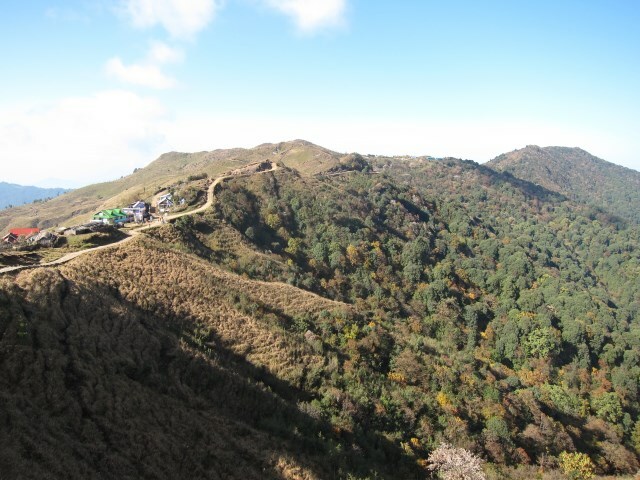 It is possible to walk the ridge without a support team, as the trail is well-established and there are resthouses and available food. 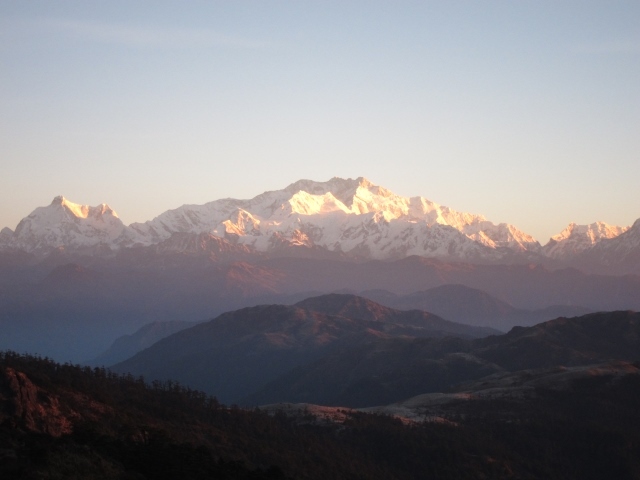 People usually walk the ridge northward towards Kanchenjunga, which has obvious advantages: the Great One is always in view, and your back is to the sun. 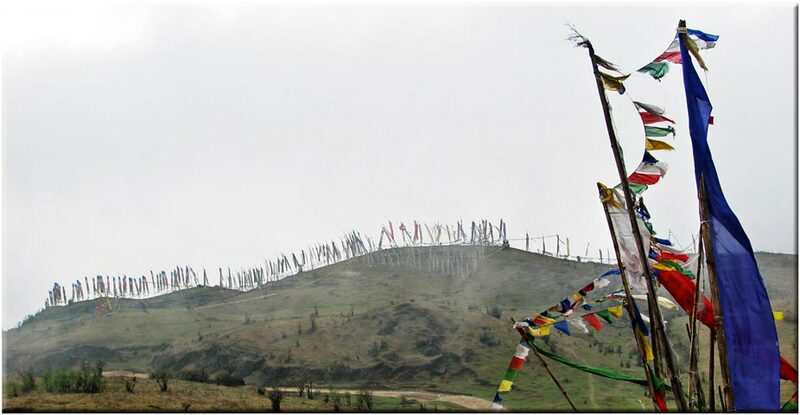 From your roadhead (there are several options, the most commonly used are Maneyghanjang and Dhodary), you will climb up to 800m to Tonglu, at 3,000m. 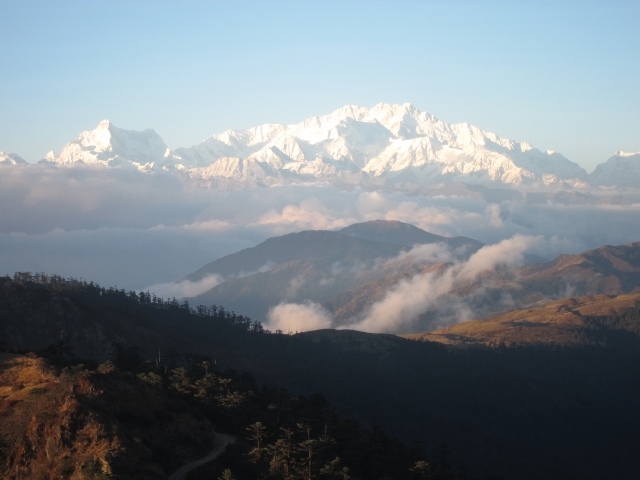 This can be a long, altitudinous slog, although you can start higher, as Walkopedia did, at Dhodray Tonglu is an interesting place, a medicinal plant centre sitting on a hilltop plateau with fabulous views to Kanchenjunga, weather permitting. A shortish day’s walking (4 hours or so) traverses very pleasantly below the top of a subsidiary ridge which leads to the main Singalila ridge. Lovely views. 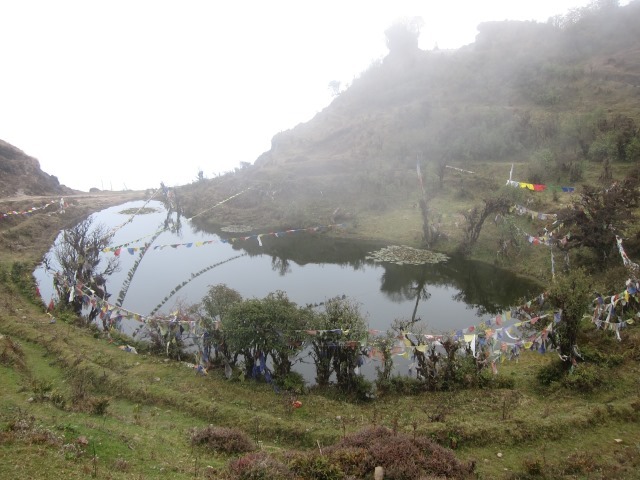 Kalpokhari, again on a ridgetop and pretty exposed, is a bit of a godforsaken hamlet (well it felt thus when Walkopedia was there – see our account) – you don’t come here for the gorgeous campsites, it must be said. 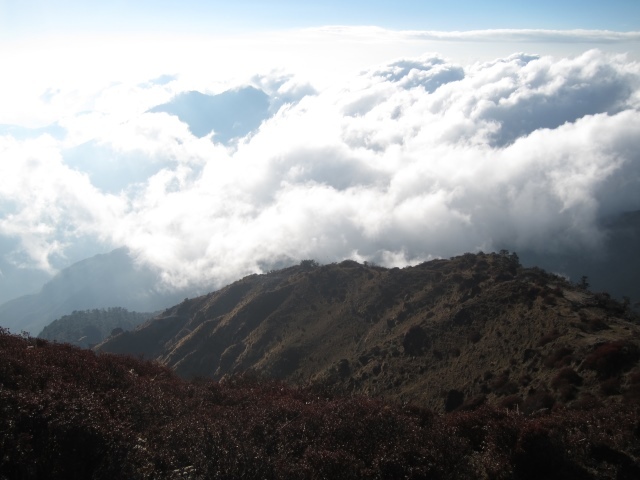 3 hours or so of steepish slog to Sandakphu (at 3,136m), on the main ridge. You’re there! 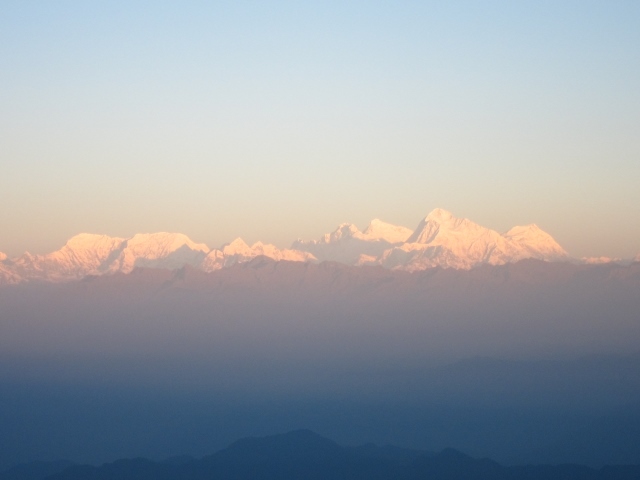 If you have started early enough, you should still see this walk’s raison d’être, the truly outstanding view of the high Himalayas, from Chu Oyu, Everest, Lhotse and Makalu in the west to the local lad, huge and magnificent Kanchenjunga directly ahead. Superlatives will abound. With luck, camp away from the depressing hotel and modern complex. Be ready for a cold night. 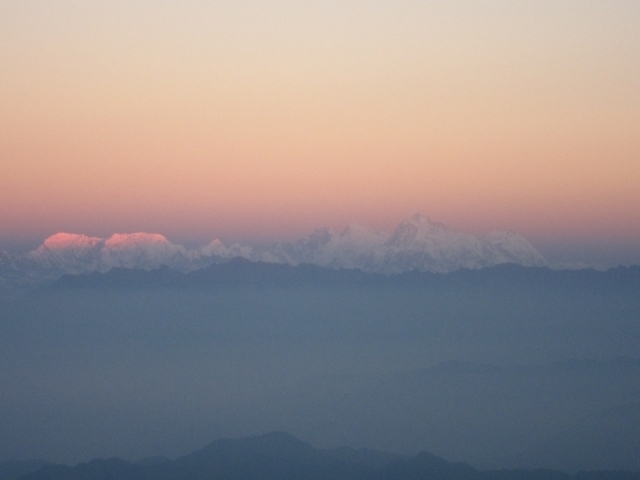 Should start with one of the world’s best dawn views. 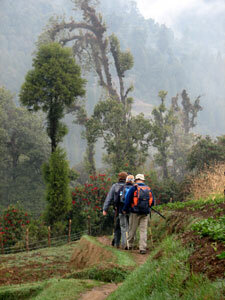 Then a marvelous meander along the ridge, revelling in the scenery and very extraordinary vegtetation. Pray it isn’t cloudy. Another cold night is likely. More of the ridge, again outstanding walking. 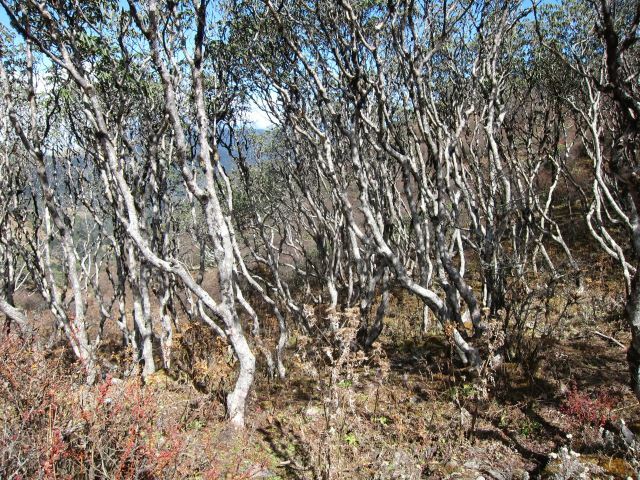 Then a 1,200m descent – one of the easiest and best laid Walkopedia has encountered, but tiring nonetheless – through fascinatingly different vegetation zones to the delightful village of Samadan, houses dotted among small terraced fields. 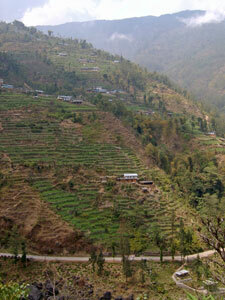 Trek out through forests, fields and villages to the road head at Rimbik. A very pleasant 5 hours or so. 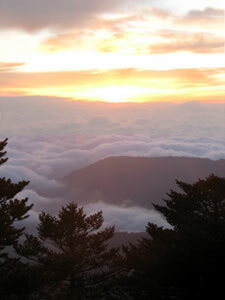 The ridge is cloudy for quite a lot of the year, so choose your timing carefully. In Autumn, the days start bright and clear, but often have clouded over by lunchtime, and you will likely find yourself in thick, cold cloud. This means that starting early is advisable, so you get the best of the day. 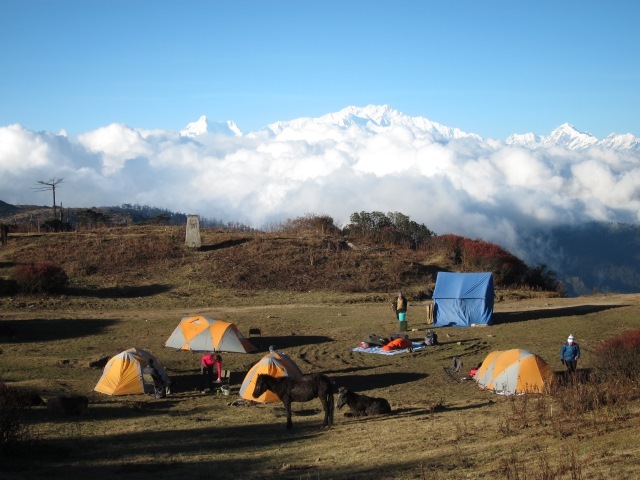 With a number of quite short walking days, the flip side of this is that you will have many hours to pass in a cold cloud-girt camp. This sounds unappealing, but it is worth it. But bring plenty of things to occupy you. 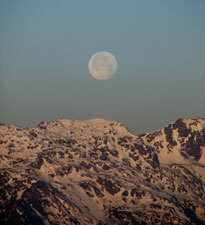 All campsites for the first 4 nights are right on top of 3,000 – 3,600m ridges. They get cold. Come prepared. 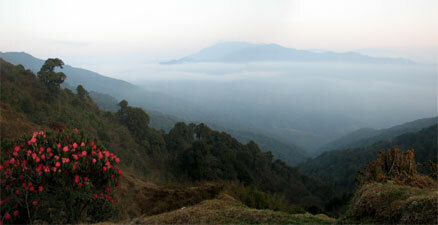 And they are dreary and degraded compared to the beautiful camping to be met elsewhere in the Himalayas. You can get white-out days even in high season. Be prepared to be accepting. We understand that from mid-November onwards these are the norm. Most of the walking is on jeep tracks. You get used to it, and it can make for the sort of walking where you don’t have to watch every step. But this does mean people, including tourist groups driving up to the hotel at the Sandakplu viewpoint. So, while this is a marvellously scenic walk, you won’t feel remote. 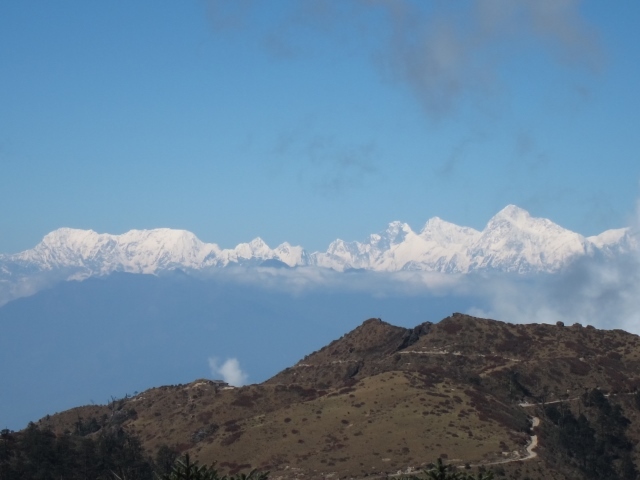 See extracts from David Briese’s excellent account of his time on the Ridge, below, or the full text at www.gang-gang.net/nomad/sikkim/Sikkim02. 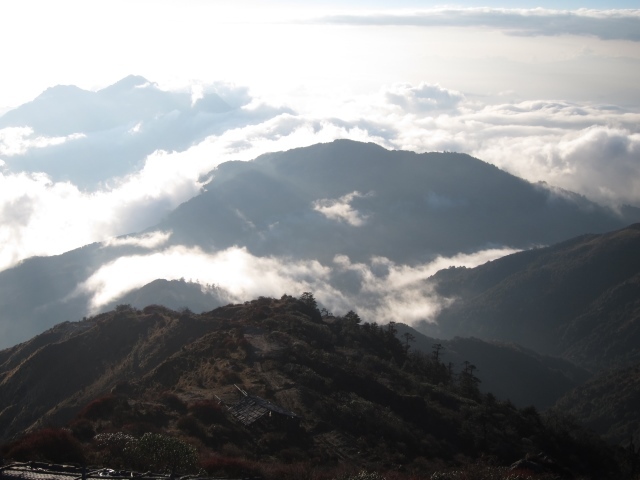 It is worth noting that David’s route was the reverse of that described here – and one should sympathize with and note his cloud-bound time on the best high-ridge section. He is impressively sanguine about it. 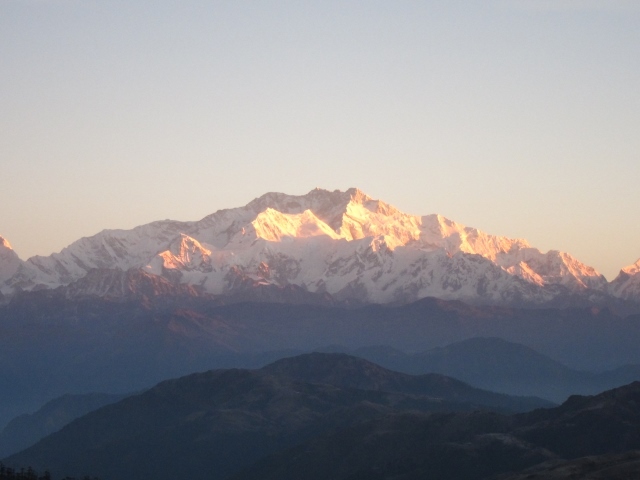 See our Kangchenjunga / Singalila page for more information and other treks in the area. We soon entered a mixed broadleaf forest, which gradually changed into a zone of tall conifers, as a dense fog settled down to create a landscape of ghostly shapes. 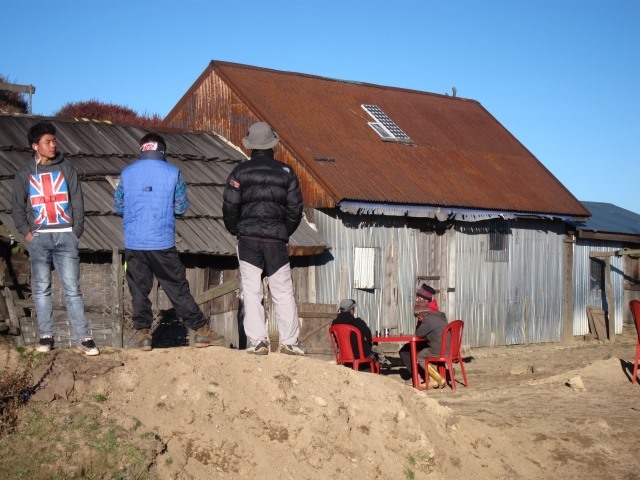 Reaching the village of Ramman, we stopped for a tea-break in a Nepalese teahouse and were greeted by the sun and the local school children on our emergence. David Briese: Walkopedia would like to thank tramper David Briese, based in Oz, for access to his personal account of this magnificent trek, walked with friends. See the full blow-by-blow description and more in his fantastic website www.gang-gang.net/nomad/sikkim/Sikkim02 (in two parts). We love it! 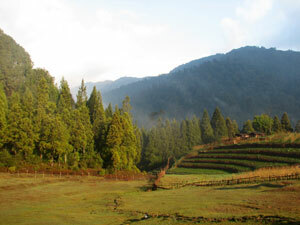 A rapid descent through the forest to cross a mossy-rock filled stream and a short steep climb on the other side brought us out to a grassy clearing, surrounded by tall firs and fields of peas and potatoes, in the village of Samanden. 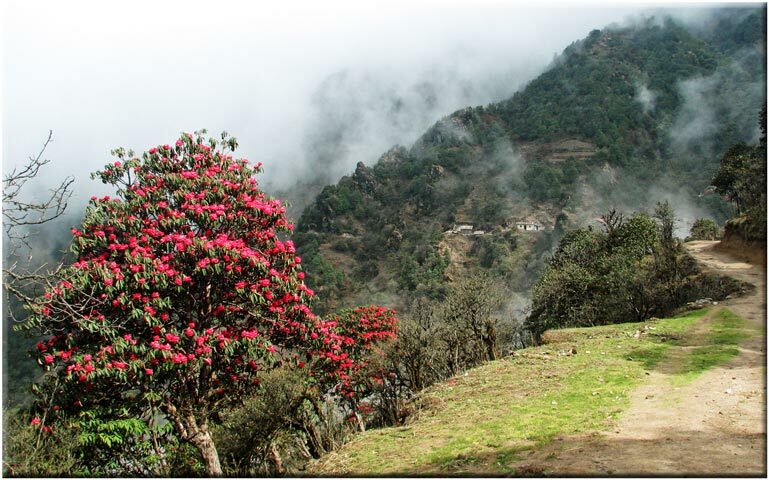 After lunch and a short nap, we wandered down a steep stone path, lined with rhododendrons and pines, to visit the village of Ghorkey; the houses of this tranquil Nepalese village were spread out over a misty valley at the junction of two mountain streams. Dropping quickly down into Ghorkey (2260m) once again, we started the 1250m climb up to the top of the Singalila Ridge. 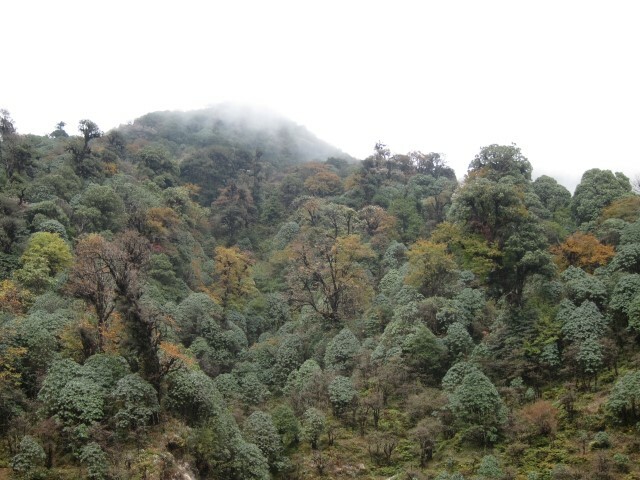 The climb started steeply through a row of prayer flags lining the path up through the village gardens and into the dense foothills forest. 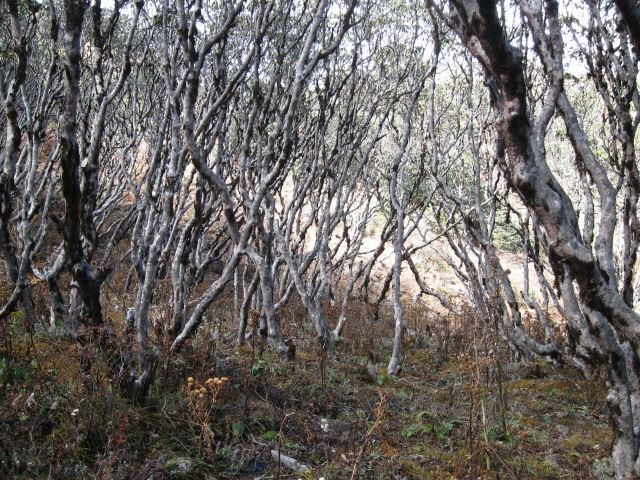 At 2900m, the track flattened out and followed the crest of one of the ridge spurs through a forest of tall lichen-covered oaks and monkey nut trees with an understorey of dense bamboo thickets. 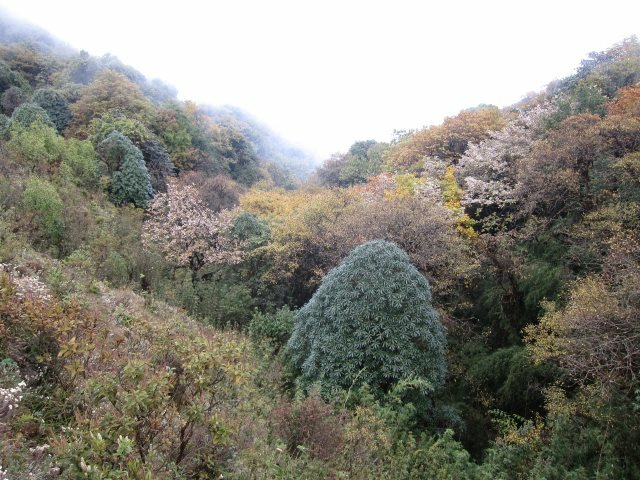 Gradually, the taller trees gave way to smaller rhododendrons, their branches overhanging the track aglow with red and pink. 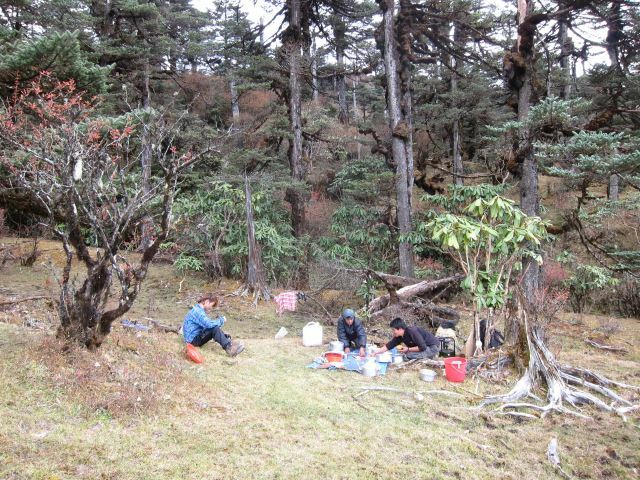 At 3250m we stopped for lunch and, as we ate, the wind gradually picked up, whipping streams of cloud through the trees on the top of the spur. Climbing on, we emerged into an open grassland, splashed with a dash of pinkish-purple primulas, and were soon enveloped in a thick fog. As the wind strengthened, Wangchuk led us across the foggy landscape to our destination at the Indian army border post of Phalut (3505m); the big climb was over. It seemed that we were walking through the dense fog in a slow-moving bubble with a 30-40m radius of visibility; there was no real perception of distance or depth, at times the ground would slope up, at times down, at times it was flat. 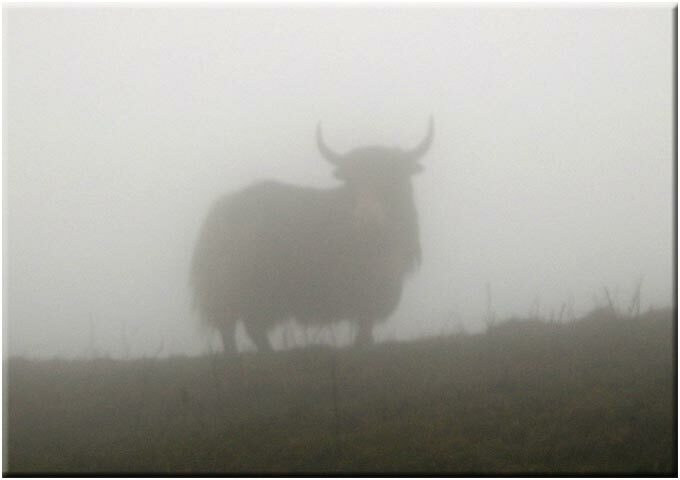 The strange ghostly shapes of trees faded in and out of our bubble, the stark silhouette of the odd grazing yak or dzo appeared and disappeared. 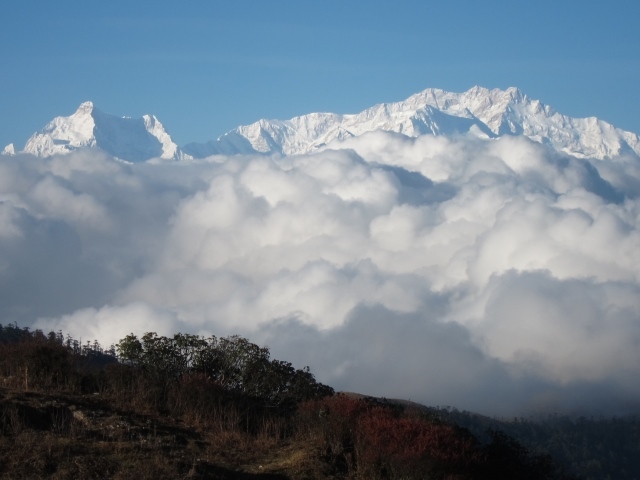 As we walked through the hail after lunch, wandering in and out of India and Nepal, my mind focused on the reactions of my body to walking at altitude; the extra slowness of pace and change in breathing patterns on the climbs. It was our first experience at walking over 3500m and we seemed to be holding up OK on that score. 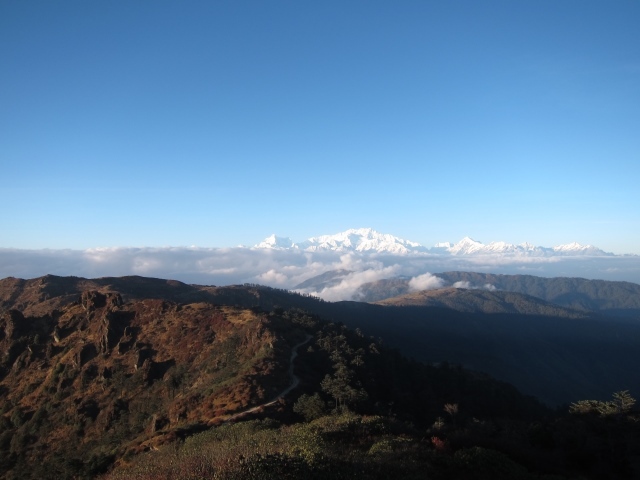 Soon, the profile of buildings drifted into our visual bubble - we had arrived at Sandakphu. 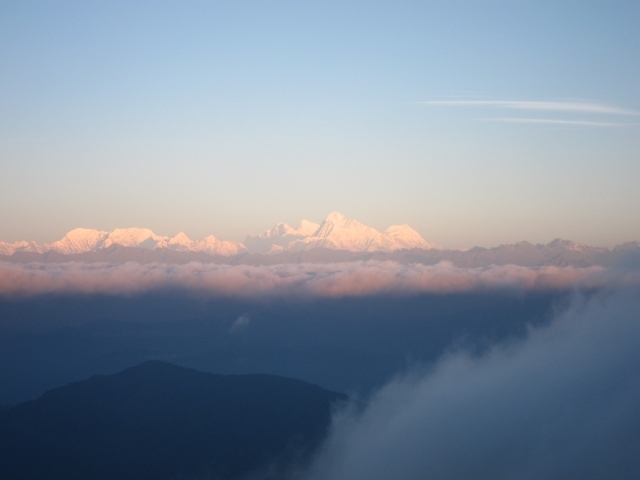 With the dawn the sun broke through over the sea of billowing cloud below us, and Kangchenjunga revealed itself for the first time. 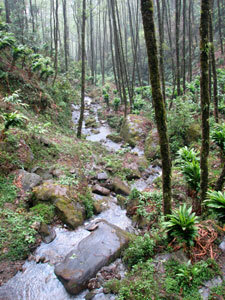 We quickly descended a stony road, surrounded by the dense green forest of the Singalila National Park. 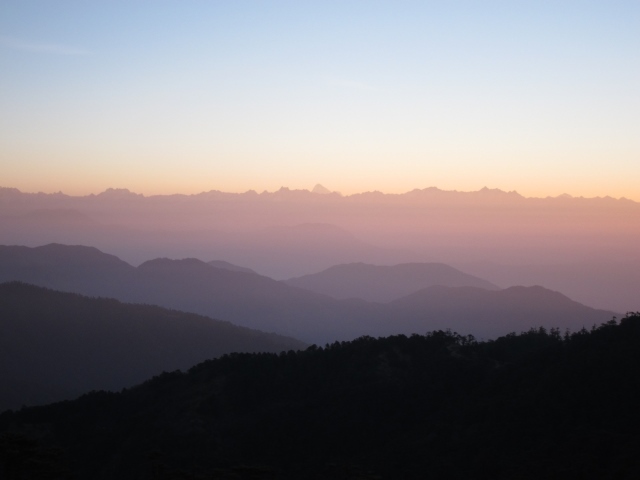 Reaching the village of Bakhay, we followed the road into Nepal, traversing the western side of the ridge through several small Nepalese mountain villages, and looking down into the deep valleys of eastern Nepal below us. 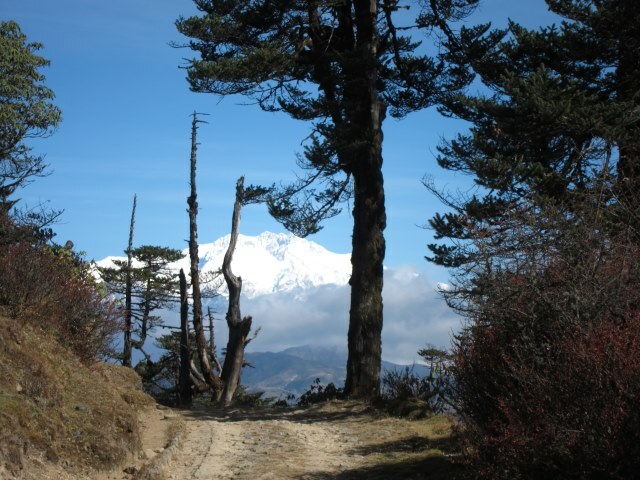 Descending slowly, the track led us through the superb forest on the Indian side, with rhododendrons, and the occasional brilliance of magnolias, lighting the way. 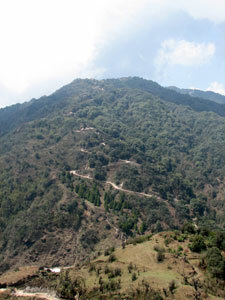 A steep descent to the village of Gairibas saw us reach our lunch stop and passport check by the border post. After lunch, we had an equally steep climb back into the treeless grassy slopes of Nepal, up to the village of Jaubari, with its Hindu temple, Buddhist chorten and burnt out police station. 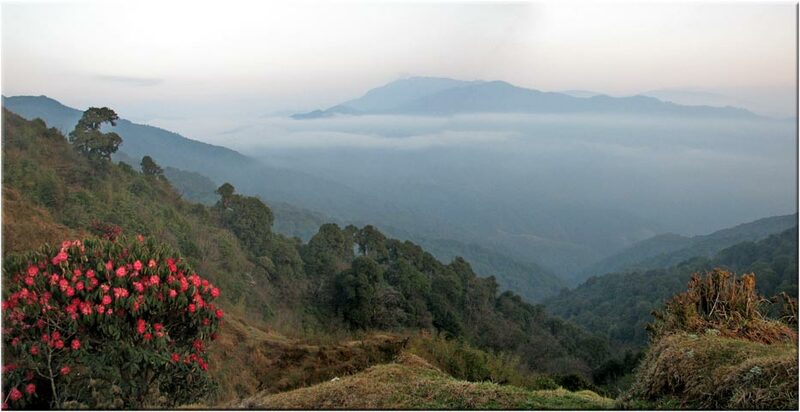 The contrast between the Indian and Nepalese sides of the Singalila Ridge is stark; on the one side, the rich and verdant forest of the Singalila National Park, on the other bare shrub-dotted grass-lands, denuded of trees by centuries of wood collection for fuel. One more zig into India, one more zag into Nepal and we reached our destination for the night, the very pleasant Shikhar Lodge at Tumling, with its large comfortable bedrooms and fire-warmed lounge. With only 12 km of trek left, we set out along a winding stony road, dropping into the bare Nepalese side once more, climbing slowly back across the ridge into India at Tonglu, with its Buddhist monastery of Senchencholing. 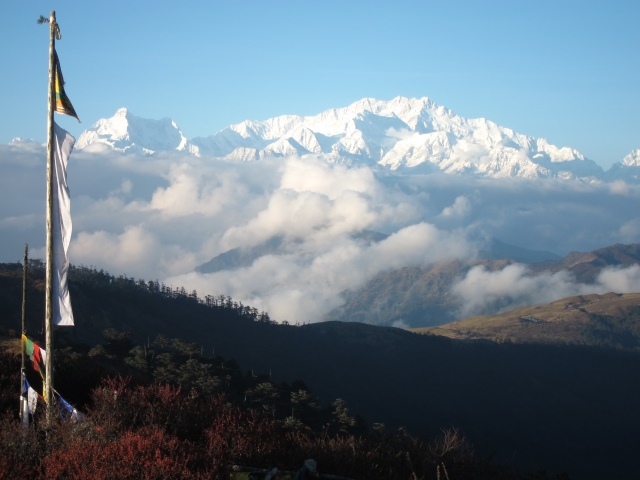 From here we followed a well formed road downward through the forest, diverting back onto open grassland near the village of Meghma, to cross a landscape of chortens, mani walls and long rows of prayer flags fluttering in the wind. Wisps of cloud began to float across as the large stupa and buildings of the Csitray Buddhist monastery appeared around a grassy hillside. 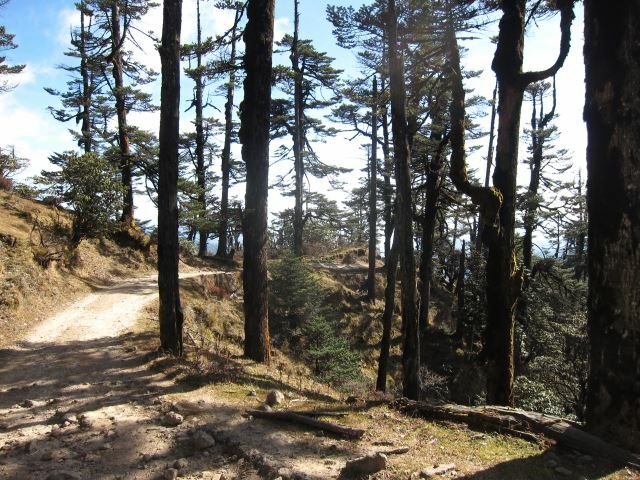 All that remained was a steep descent along a stony footpath and road through the blue pines to Maney Bahjang, where our transport back to Darjeeling was waiting. 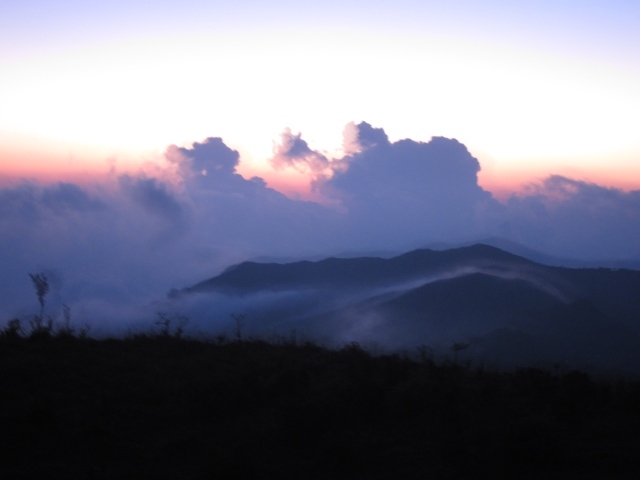 The fog had once again returned to the ridge by the time that we arrived; as we started so we finished!